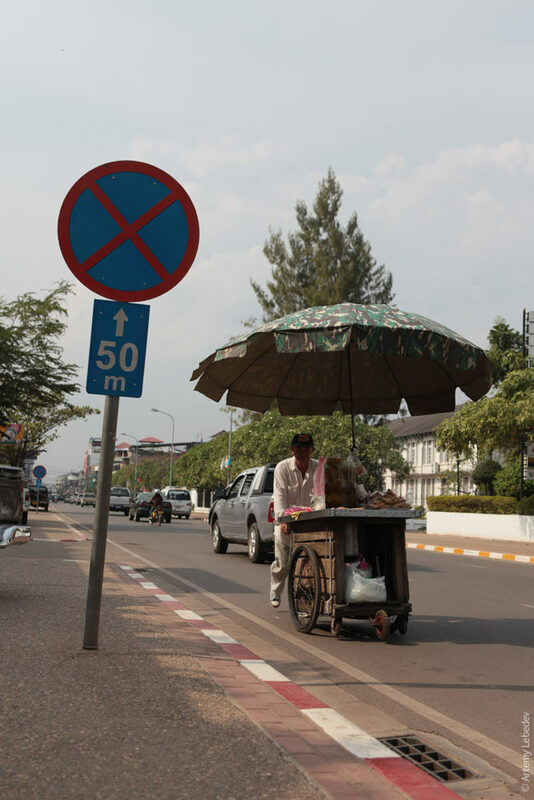 All the dust pans in Laos have long handles so that you don’t have to stoop down when using them. 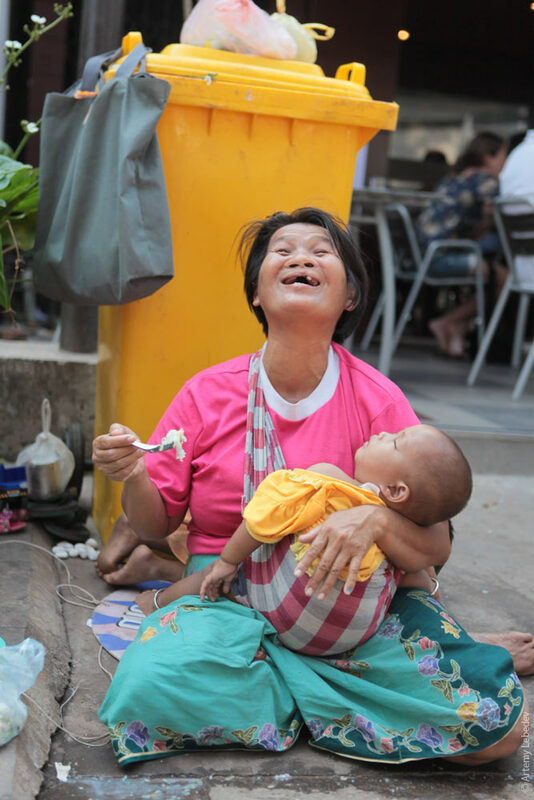 Actually, they’re like that in Vietnam and Cambodia, too. A woman frying chicken feet. Reminded me of the quails in China. 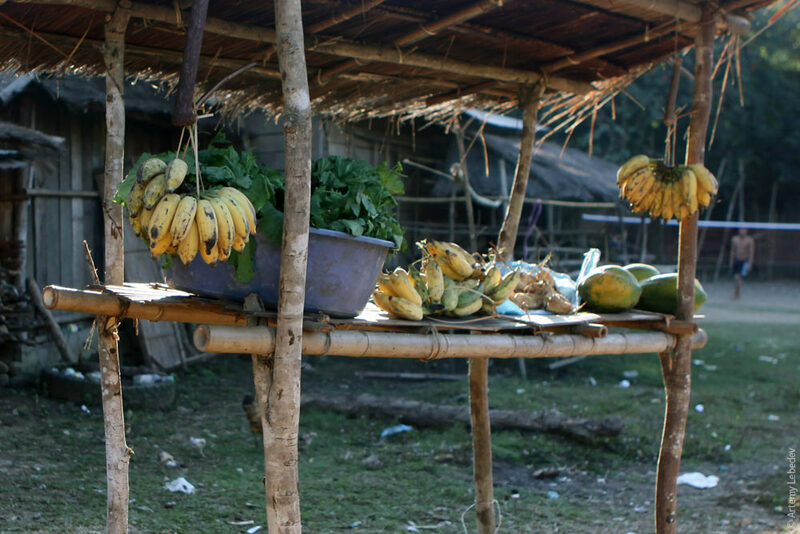 I swear, Laos has the most delicious bananas in the world. They’re stubby and barely even smell like bananas. But you bite into one and realize that all other bananas in the world are just a pale imitation. 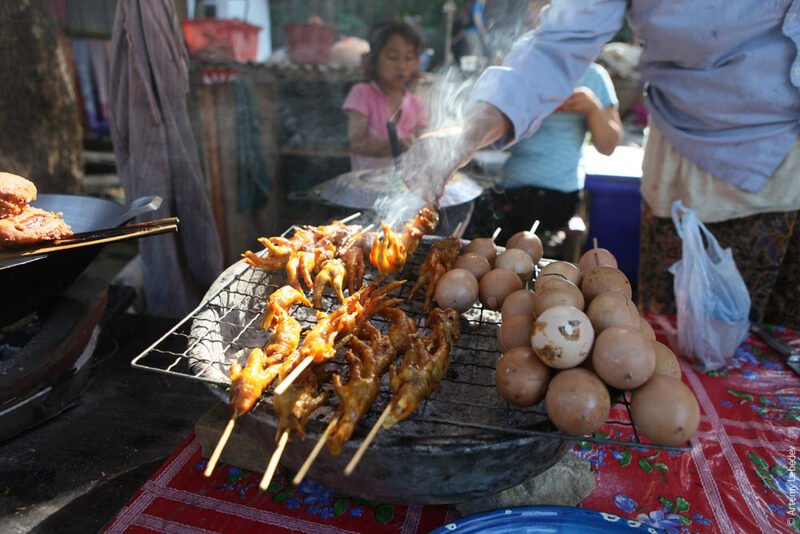 At the spot where you bite into it, the Lao banana becomes slippery like a marinated mushroom and sweet like honey. But it’s not cloyingly sweet. It’s surprising that right nearby in Vietnam, bananas have more of an aroma but don’t quite compare in taste (although at first I declared them the most delicious in the world). 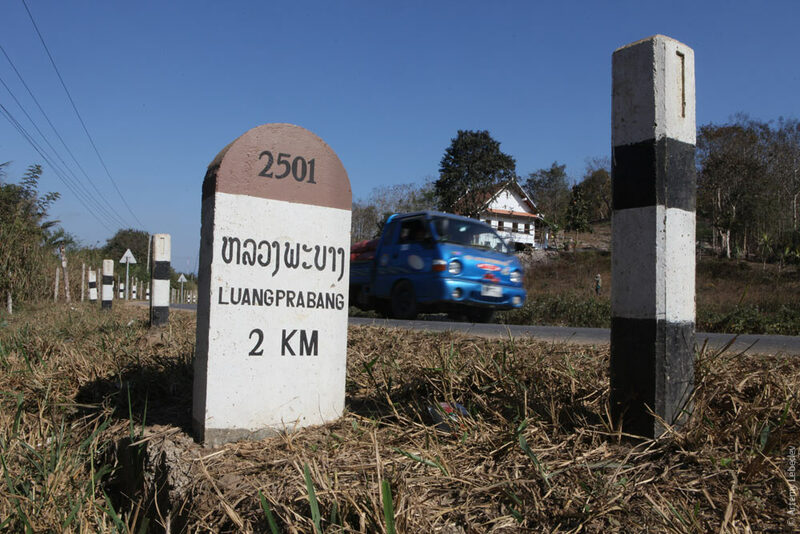 Laos is a communist country. 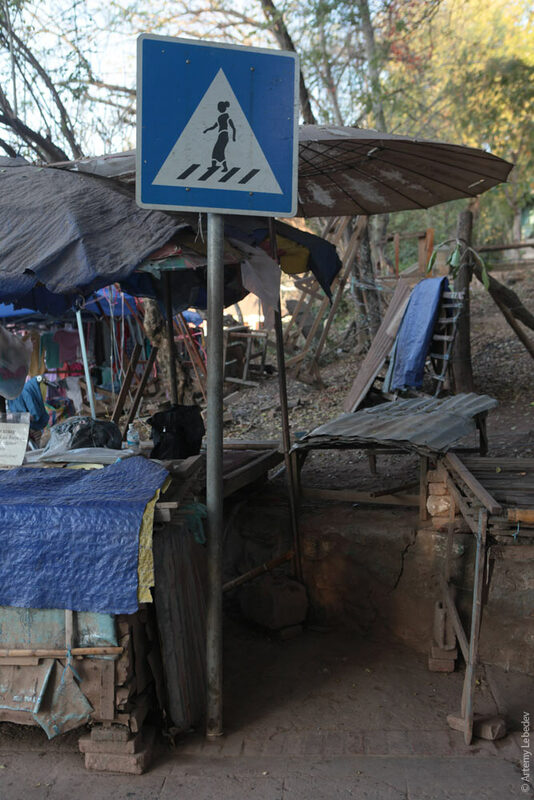 But the communism here is oddly peaceful, quiet and calm. 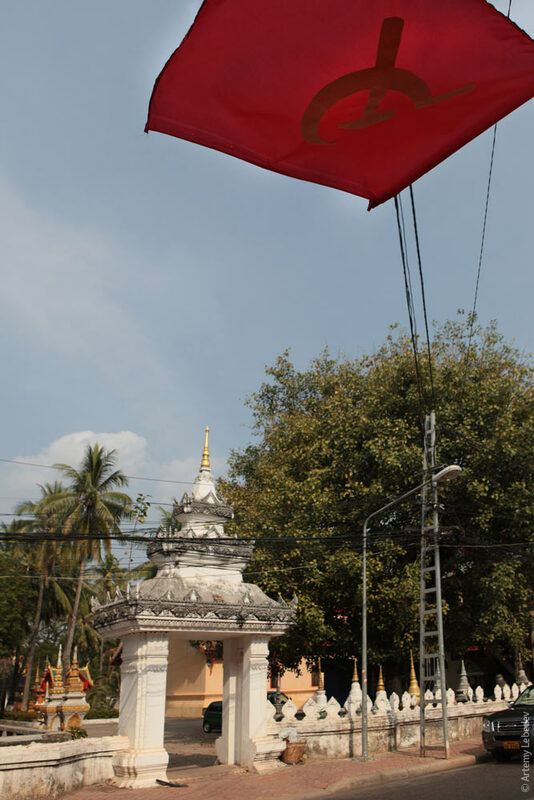 Communism and buddhism coexist effortlessly side by side. 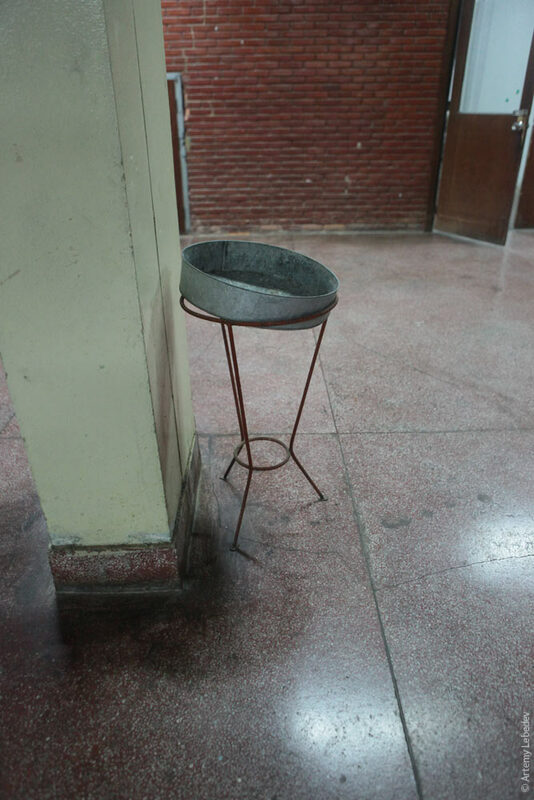 There are prayer stations on every corner. 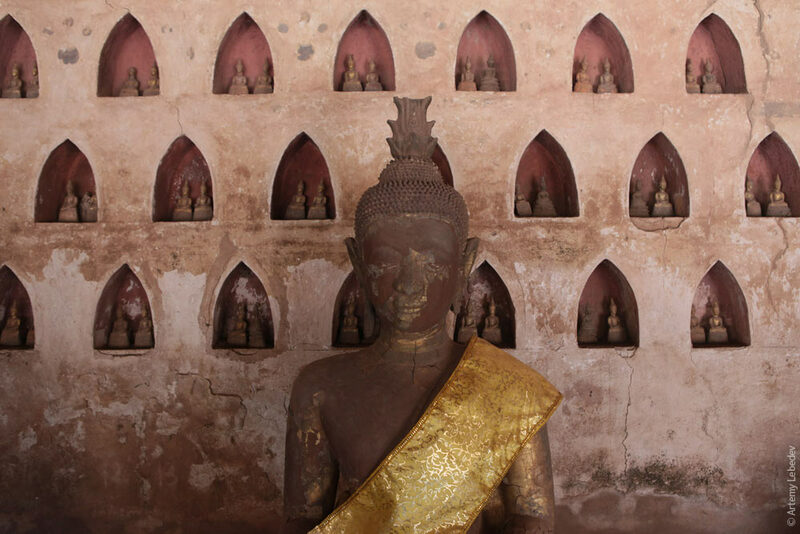 Monks sculpt Buddhas out of concrete. 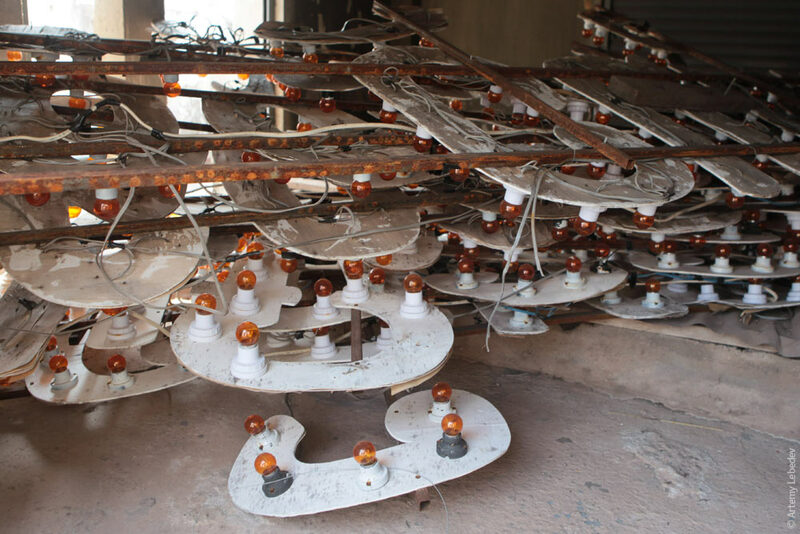 One statue is already done (in the middle of the photo in the background), the other one (the armature on the left) is in progress. Auto rickshaws are pretty common. 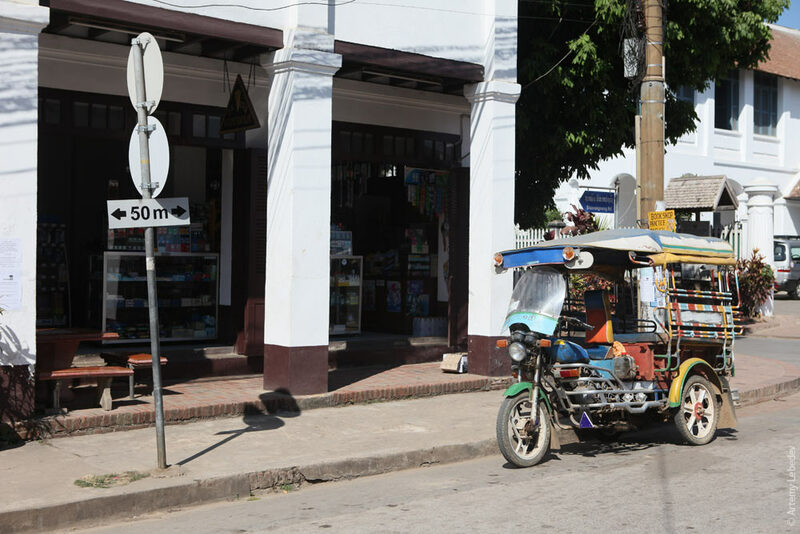 Motor taxis are a one-piece construction, unlike in Cambodia, where the passenger cabin is attached to the back of a motorcycle with a tow hitch. 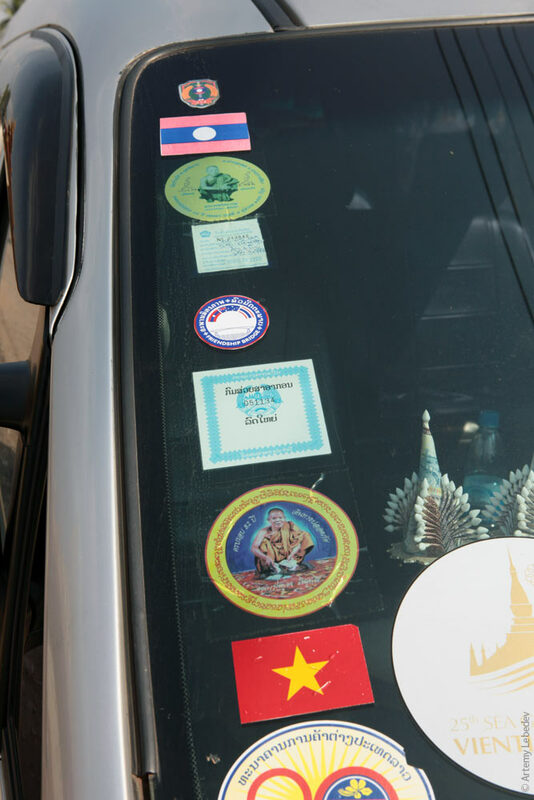 Various stickers for motor vehicle inspections and permits. 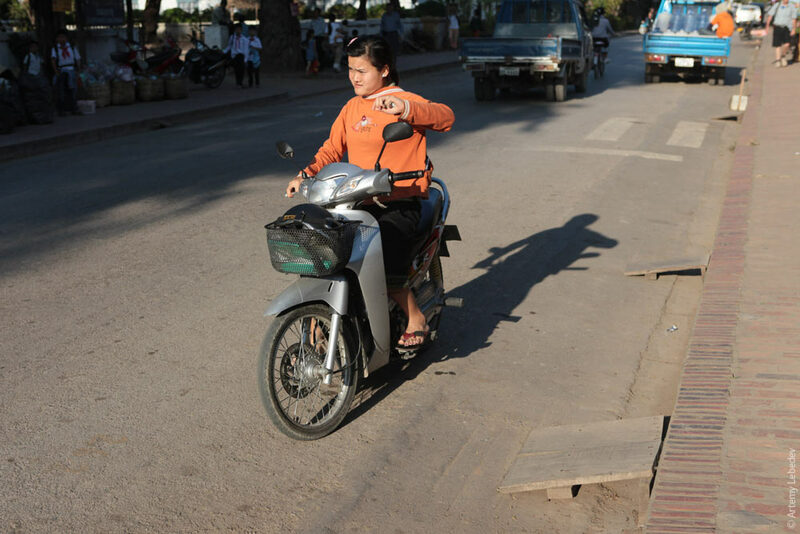 In Vietnam, the portable sidewalk ramps are made of metal. 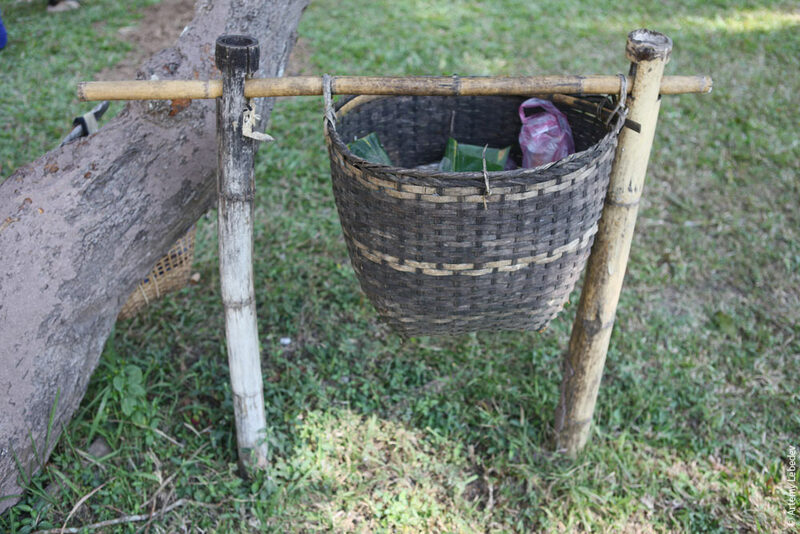 In Laos they’re made of wood. 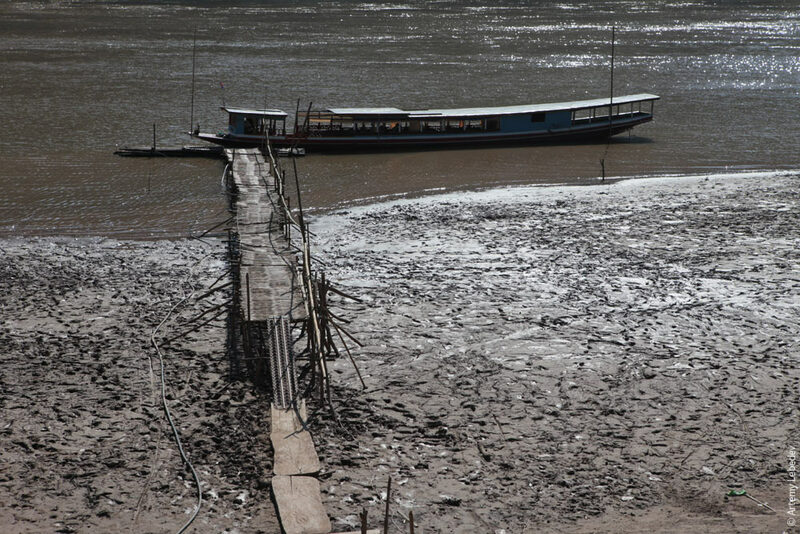 Boats are always long and curved. 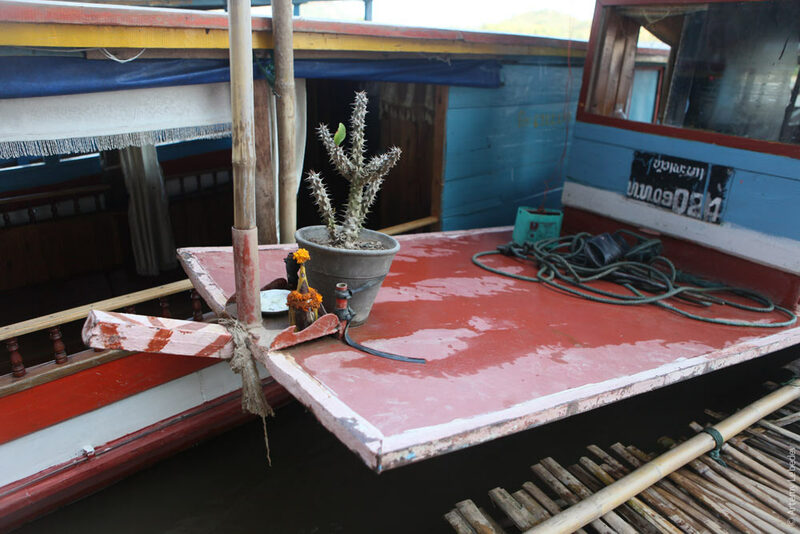 No matter how big or small a boat is, it always has to have flowers on the bow. 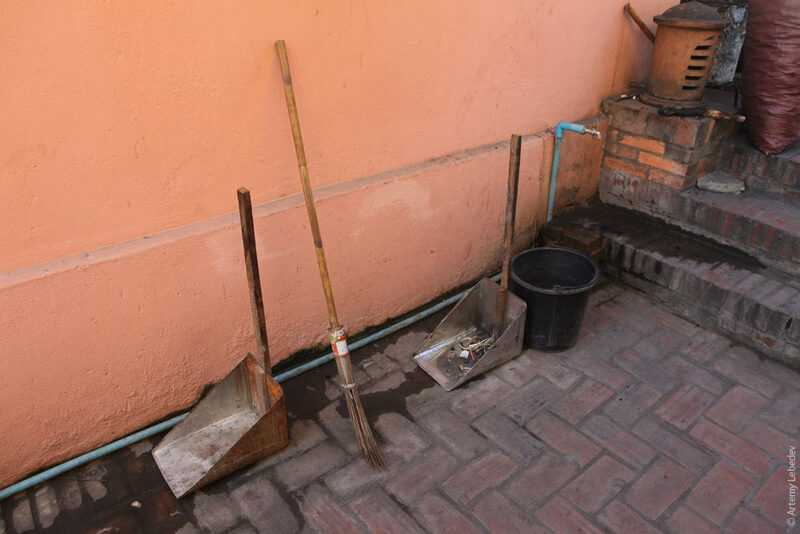 Some people plant an entire garden, others make do with a single cactus. But you’ve got to have at least something. 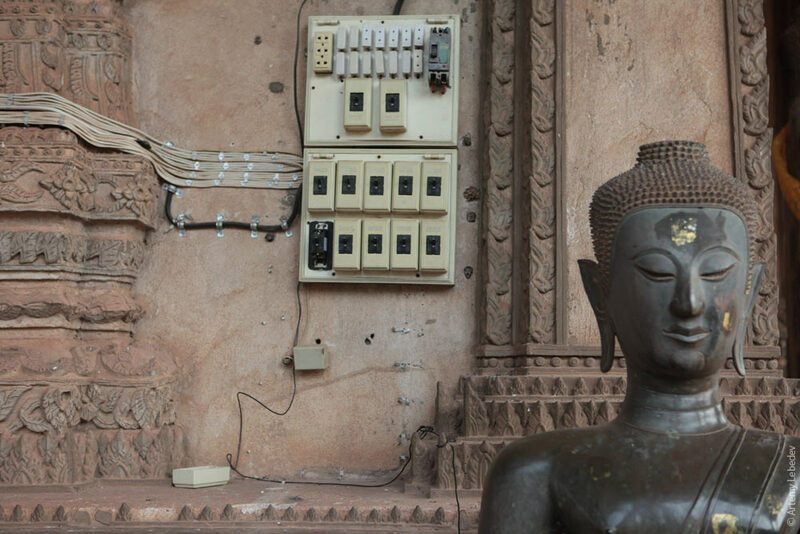 The wires going into the electricity meter are fastened to the wall carefully and evenly, in typical Lao fashion. 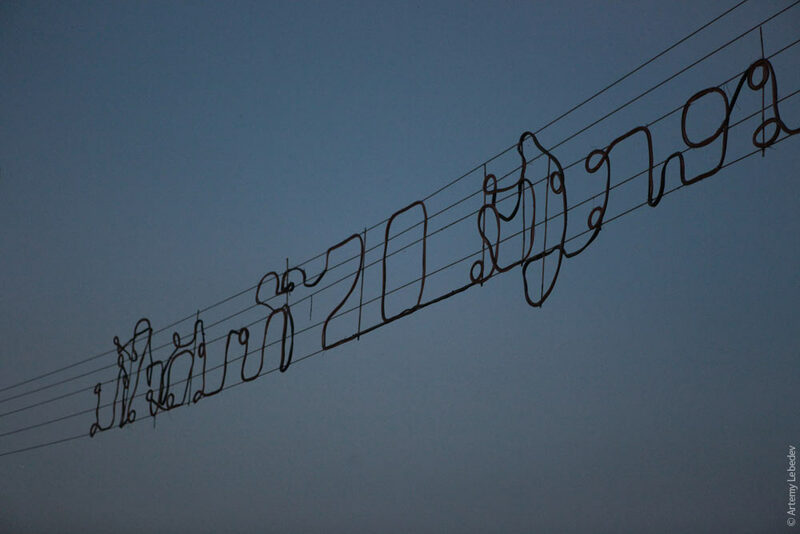 The Lao script is perfectly suited for creating words out of flexible cord. 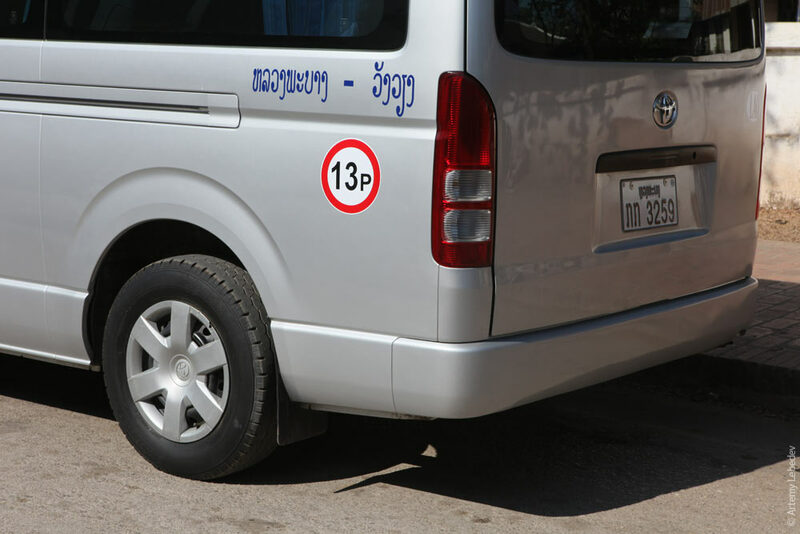 Public transit vehicles (starting with minivans) display the passenger capacity on the side of the vehicle. 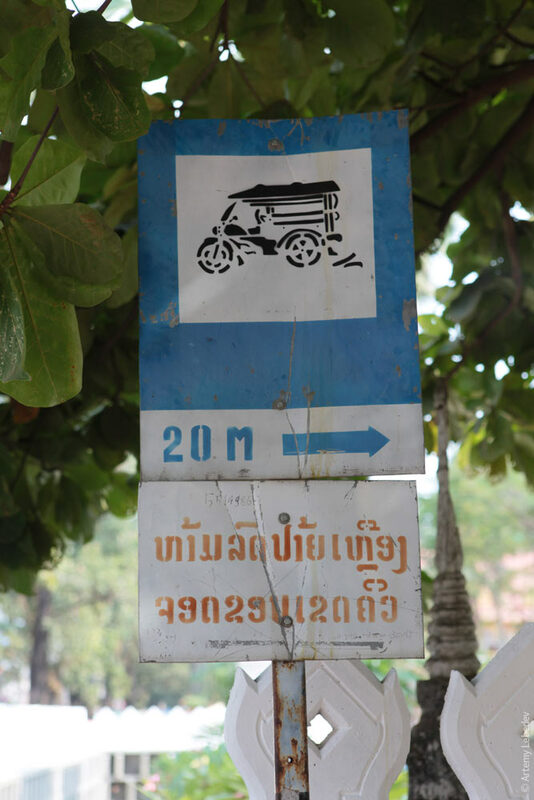 There are French concrete kilometer markers everywhere, just like in Tunisia, Vietnam and Cambodia. 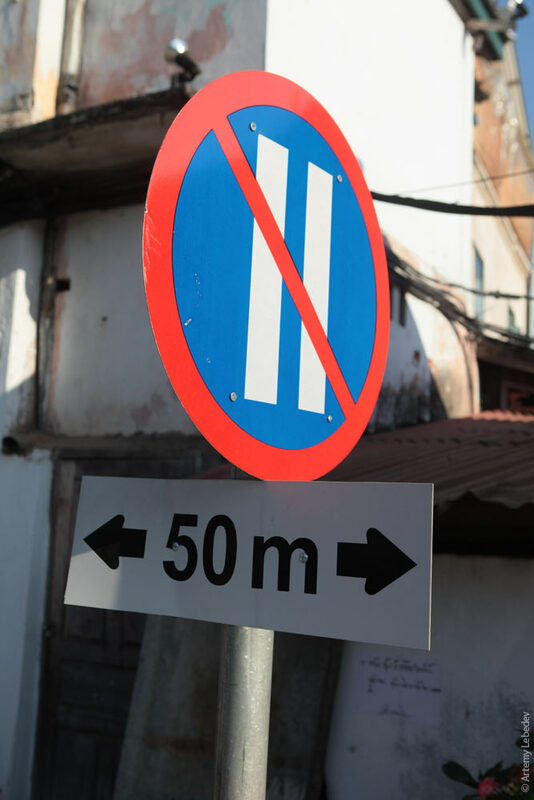 In addition to the number of kilometers, they also indicate the type of road. 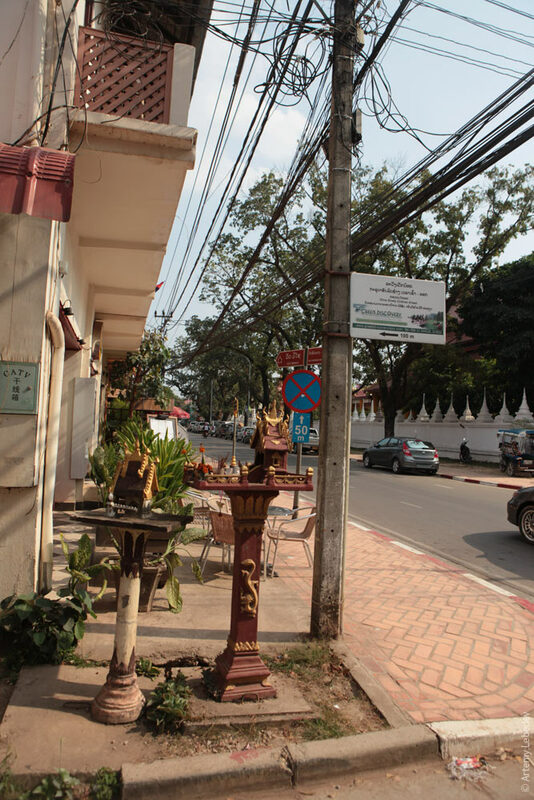 Luang Prabang is a Buddhist tourist destination. The post boxes here are made out of concrete. 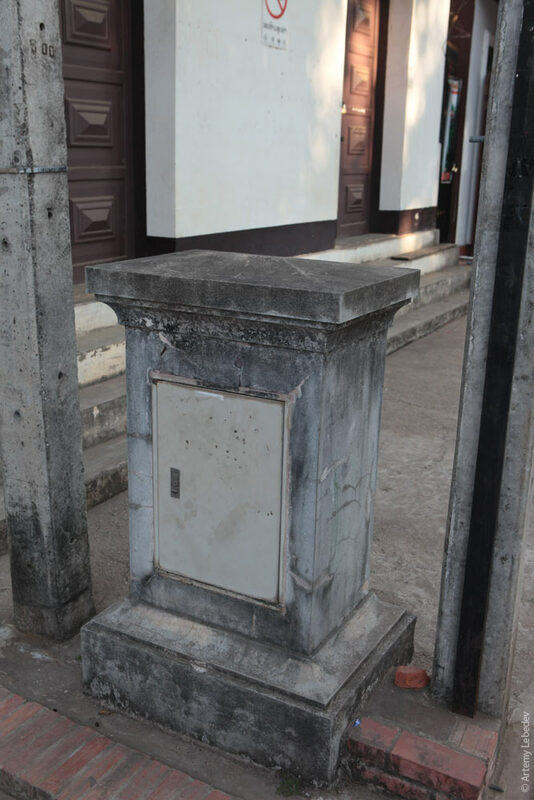 Curiously, the exact same kind of concrete pedestal (minus the letter slot) is used as a street electrical box. > A sign which forbids parking on even-numbered days is accompanied by a plaque indicating its range (like in Iceland). 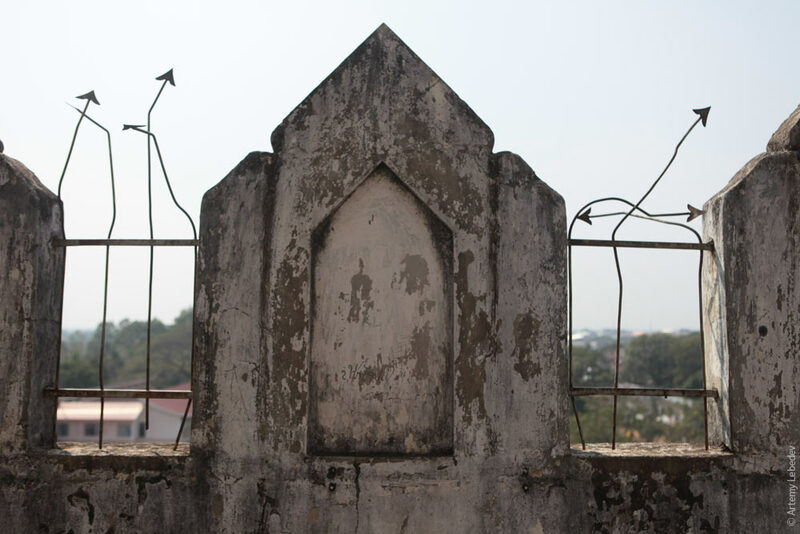 The plaque is affixed perpendicularly to the plane of the sign. Amazingly, it’s very visible. 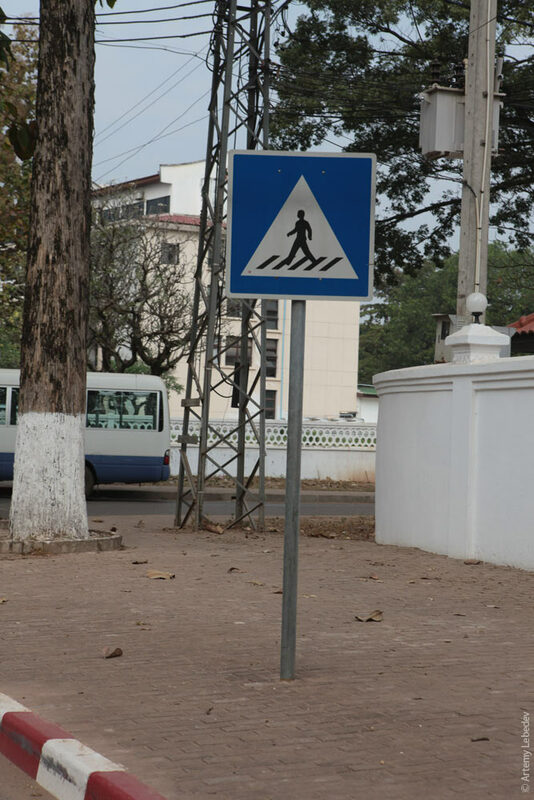 Pedestrian crossing signs all depict the same young woman with bad posture and her hair up in a bun. 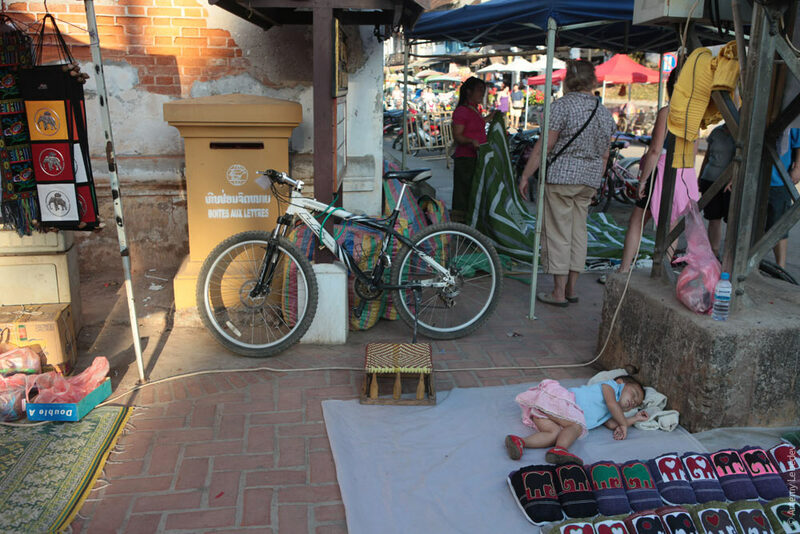 Luang Prabang is a major religious center, it’s full of temples and monks. 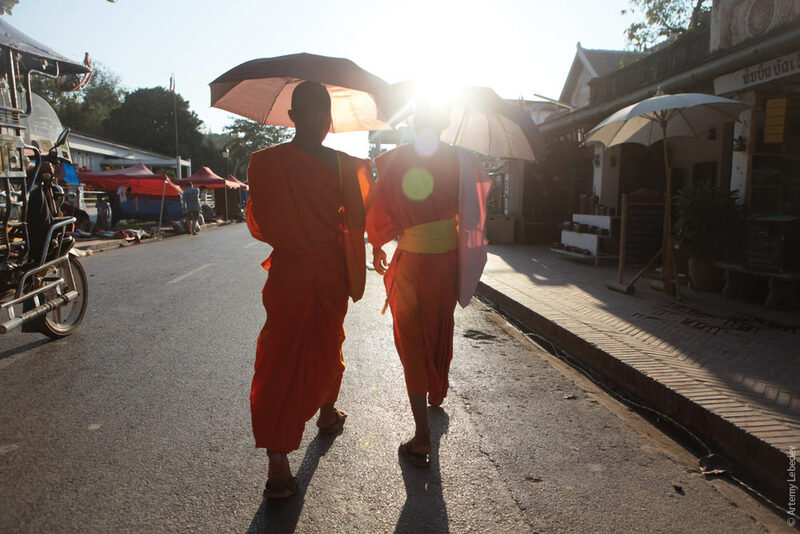 The monks like to walk in pairs, carrying umbrellas. 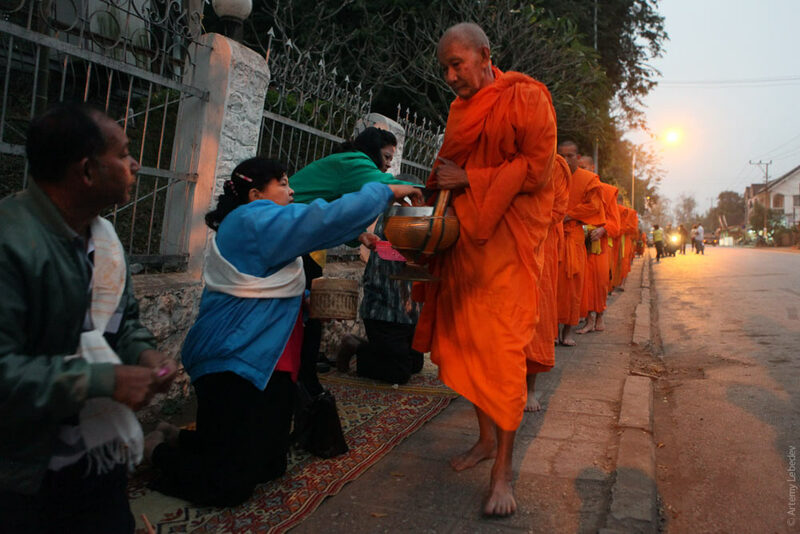 Every morning, the monks walk in a line along the main street of the city, and the locals give them various kinds of food (mostly sticky rice). 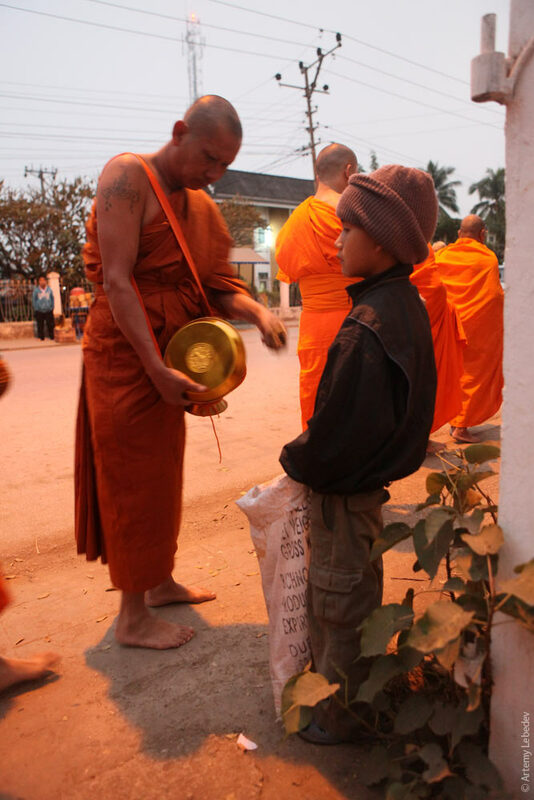 Amazingly, there are even poorer people who line up along the procession of monks to receive some of their food. There are big yellow dumpsters all over the city in place of trash cans. 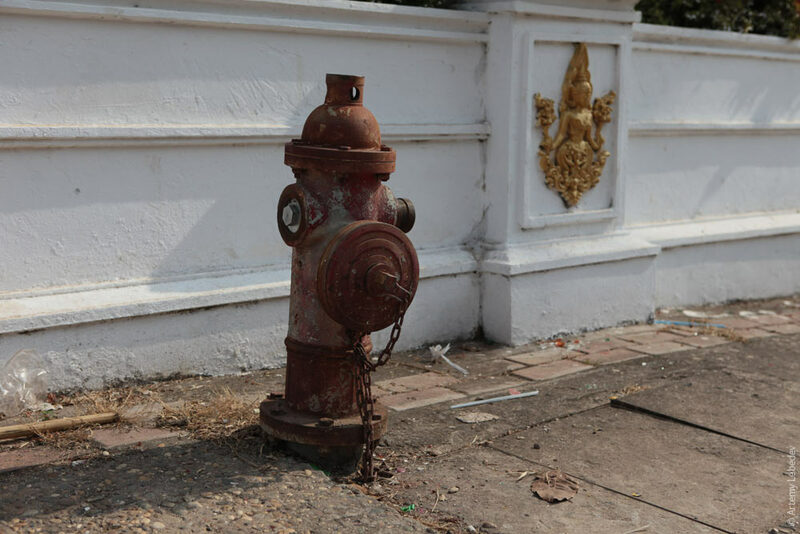 Vientiane is the capital of the country, so it even has fire hydrants. The pedestrian crossing sign here has a guy instead of the girl we saw before. And the plaque indicating the range of a traffic sign is affixed in the same plane as the sign itself. 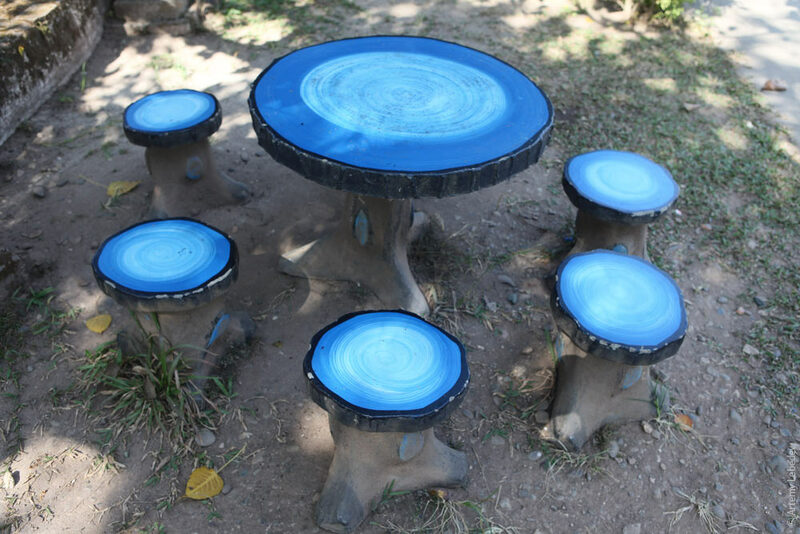 The outdoor tables in the capital are made out of some kind of concrete or artificial stone and covered with tile. Every single one of them is equipped with a chessboard. 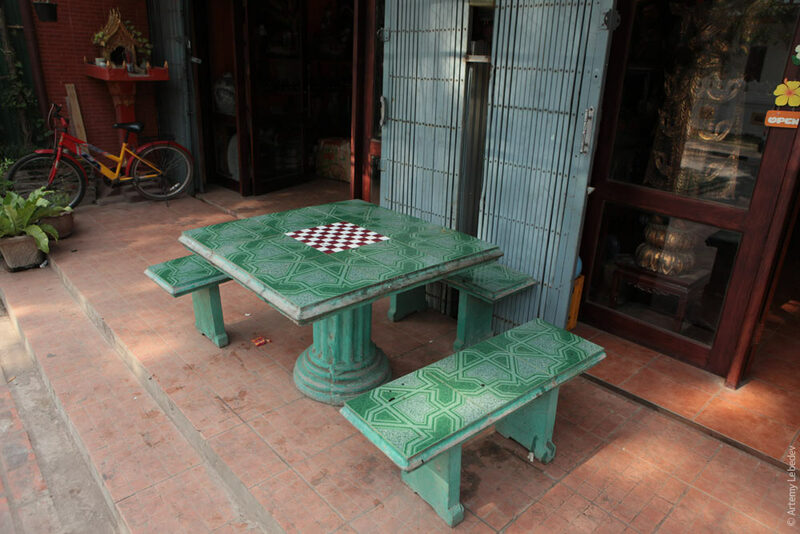 Not once did I see any chess pieces, though. 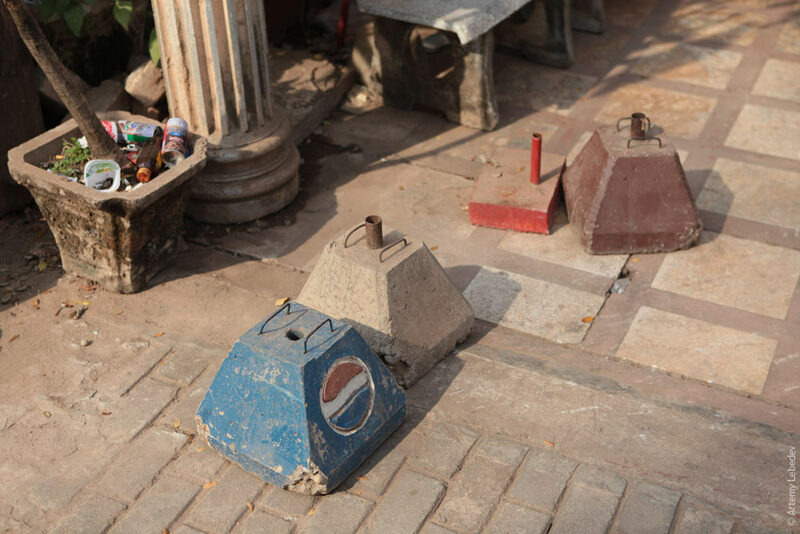 There are concrete bases for patio umbrellas (which look like weights) in front of every store. 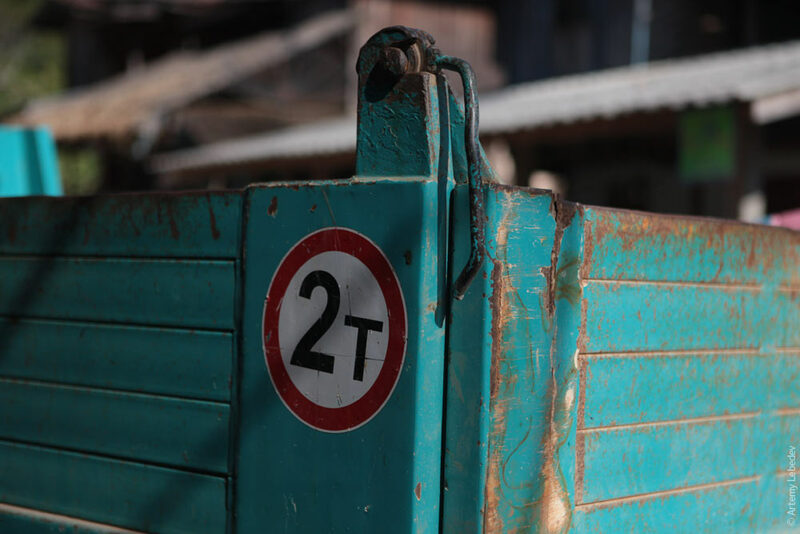 A uniquely Lao detail. Decorative fencing on the main triumphal arch in the country. Lettering left over after some holiday. 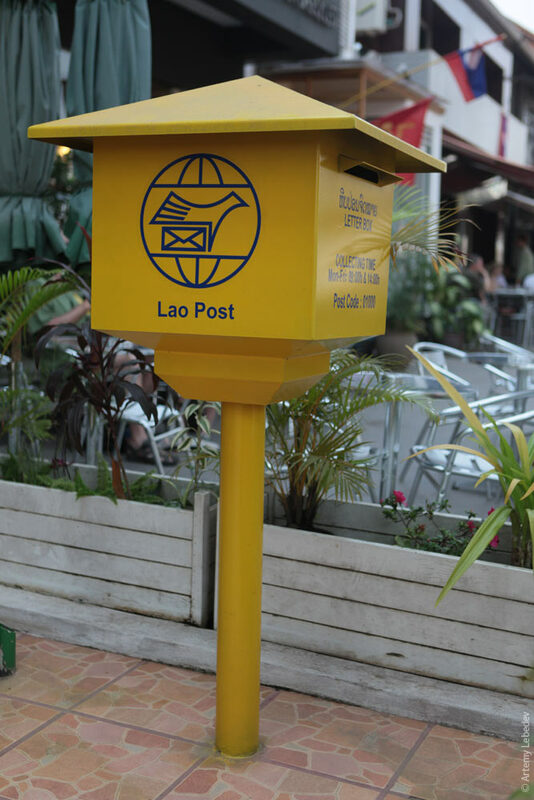 The tops of the post boxes in the capital resemble the Lao national hat. 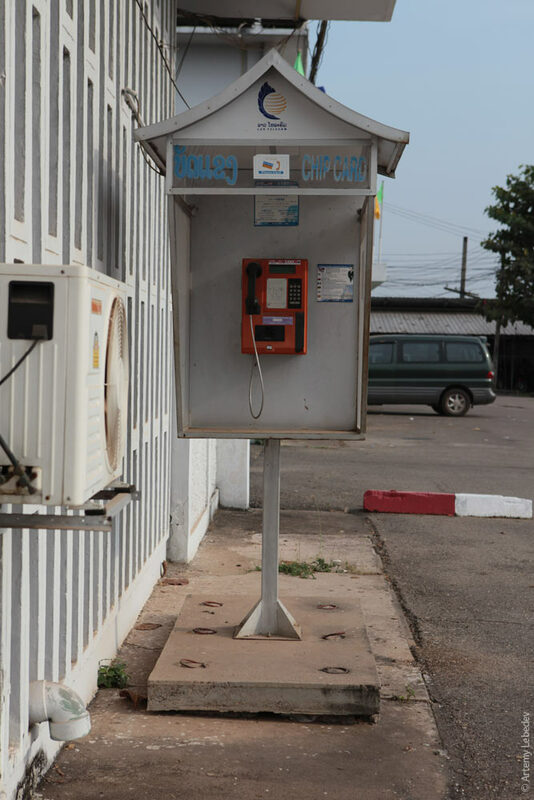 And the tops of the phone booths, too. 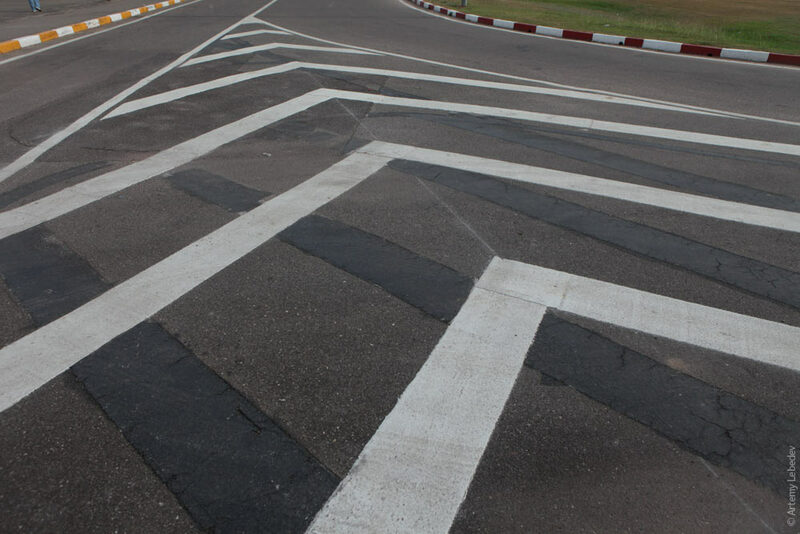 Even the road surface markings seem to have national character.